Red Velvet Cake | FoodGaZm..
A Red Velvet Cake is very dramatic looking with its bright red color that is offset by a creamy white frosting. There are many theories as to its origin. Some say it comes from the South, others say it originated in the North. All we really know is that it has been a favorite for decades, not only in the States but also in Canada (it used to be sold in Eaton's Department Stores). It is really a Devil's Food Cake that has red food coloring added to it. John Mariani tells us in his book "The Dictionary of American Food and Drink" that the name 'Devil's Food Cake' is so called "because it is supposedly so rich and delicious that it must, to a moralist, be somewhat sinful." If we look beyond the striking appearance of this Red Velvet Cake, we will find that it has a mild chocolate flavor with a moist and tender crumb. The mild chocolate flavor comes from adding a small amount of cocoa powder to the batter and buttermilk gives it a moist and tender crumb. If you are not familiar with buttermilk it has a nice thick creamy texture with a rich tangy buttery taste that makes baked goods tender. You can make your own buttermilk by adding 1 tablespoon of white distilled vinegar, cider vinegar, or lemon juice to 1 cup (240 ml) of milk. Let this mixture stand 5 to 10 minutes before using. 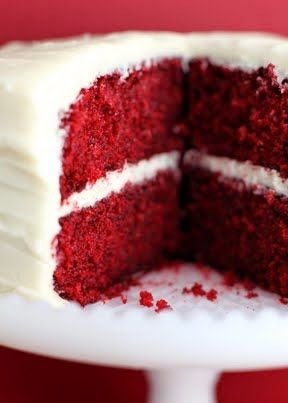 Once the Red Velvet Cake layers have been baked and cooled, I find it is best to place the cake layers in the refrigerator (for several hours) or freezer (for at least an hour) before frosting. This extra step makes the spreading of the frosting a much easier task as a freshly baked cake is quite fragile and when you try to spread the frosting there is a tendency for the cake to tear. Refrigerating or freezing the cake first eliminates this problem. In fact, you may want to bake the cakes the day before you need them and then you can just place the cakes in the fridge overnight to firm up.